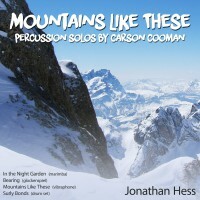 Mountains Like These (2007) capriccio for solo vibraphone was commissioned by and written for percussionist Mike Perdue. The work opens with the gentle unfolding of a series of pitches, outlining a harmonic field that will be transformed and explored throughout the remainder of the work. Written while in Aspen, Colorado (amidst mountains of all shapes, colors, and sizes), the music explores the sense of adventure one can experience when traversing a new landscape.